Harding Steel’s unique CARPARX ST-3 subterranean parking system allows two conventional vehicles to be parked in secure, below-grade parking locations while allowing a third vehicle to be parked on the surface space above the machine. The ST3 features a large, single-acting scissors lift assembly powered by four hydraulic RAM cylinders. The ST-3 requires a below grade pit structure that is built to Harding Steel's specifications. Adequate pit depth and ceiling clearance is necessary for these systems. All ST-3 systems are built to order and custom configured to each project. 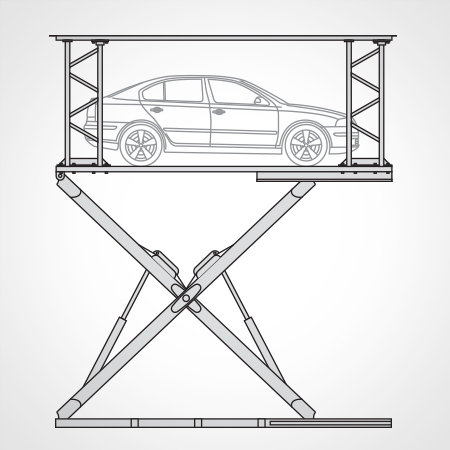 Lower level platforms can move vehicles weighing up to 6000 pounds. Upper level platform creates a protective steel plate over the opening in the garage floor that will also support a vehicle weighing up to 6000 pound capacity per platform. Transport systems must be properly enclosed and/or gated for safe operation.